Good health is good for business! Workplace wellness seminars are an investment in your businesses most valuable asset, you're employees. Physical and mental performance demand good nutrition. Get your staff performing at their best! Finding ways to help your staff eat well, sleep well, lead an active lifestyle and manage stress will ensure that they are able to perform at their best. I will encourage and motivate your staff to take ownership of their health, boosting productivity and minimising employee sick days. I am a qualified NZ Registered Nutritionist and healthy living advocate. I have a holistic approach to wellbeing meaning I consider all aspects of wellness such as lifestyle factors (stress/adrenal health, exercise, sleep, digestive health and so much more) alongside nutrition. My workplace wellness seminars are always informative, inspiring, fun and interactive. Workshops are either 30 or 60 minutes. In these workshop settings staff will learn how to eat well in the office and learn areas of their life they need to work on to transform their energy and work more efficiently. Get in touch today for enquiries! I am thrilled you have contacted me about corporate wellness. I aim to respond to all email queries within 24 hours. Natalie came and did a presentation for Qantas Airlines, she was amazing, such great advice and very relevant information catered to the aviation industry of shift workers. She put together a take home book for all the attendees and this had some fantastic information in it from nutrition to exercise and useful tips about staying healthy in transit. Thanks again Natalie, we thoroughly enjoyed the presentation during our health and wellbeing week. how and how to help others do so. As part of our FiTober campaign, Geneva had the pleasure of hosting the renowned Nutritionist Natalie Brady. FiTober is all about teaching and encouraging our staff to stay healthy and live their best life. Natalie visited head office today to share her knowledge around keeping fit and healthy. Natalie emphasises that health and wellbeing is not just about your diet, but that mindfulness and learning to break up your day so as to de-stress is of equal importance. Our FiTober members learnt a lot about staying healthy and managing their lifestyle, as well as gaining a few extra points for the competition! Thanks for making the effort to come in and present. Our team really enjoyed the seminar and got lots of useful information out of it which we can implement into our workplace to improve productivity. 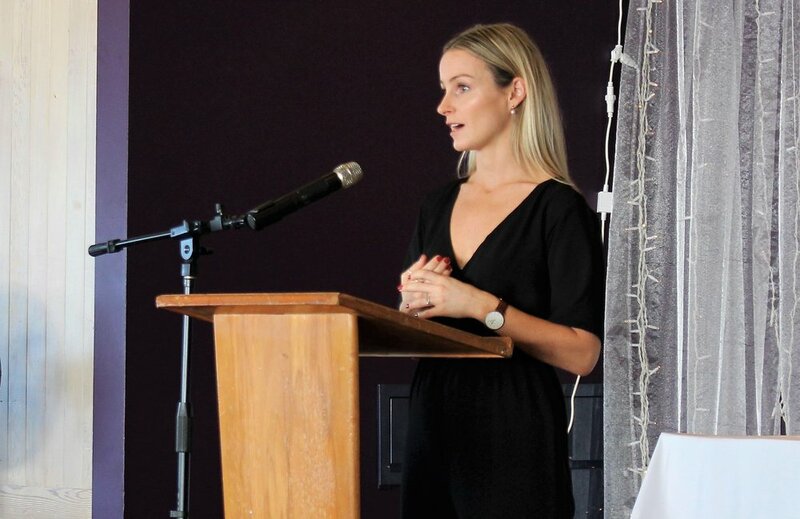 We had Natalie speak at our school’s ‘Ladies Lunch’, she was an informative and interesting speaker. Natalie shared her top tips for busy mum's which really appealed to our audience, she was lovely to have as our guest speaker. (Nicki Williams, Marketing & Comms, Pinehurst School). I highly regard Natalie and her knowledge both as a personal nutritionist for myself and my family, but also as a nutrition coach for my clients. Natalie created great material for my clients and simplified the scary world of nutrition for the masses - no easy feat. My clients found the content easy to follow, this is really important for staying on track when busy. Natalie explained it even further in person when she presented for us. Natalie's lovely nature makes it a breeze to work with her, you can tell that she loves helping others. Natalie spoke about the importance of whole, clean foods and nourishing your body and was full of knowledge! Thank you for taking the time to come and speak with the Miss Auckland girls, they all gained a lot of knowledge about nutrition and wellness to take home with them!